Every evening from 31 July to 23 August, family entertainment and dinner. The show includes clown David Larible, balancing artist Oleg Izossimov, the Troupe Kazan performing trapeze and juggling, the ballet Troupe Bingo and comedy waiters the Brigade des Castors. Music is provided by Maestro Carmino d'Angelo and the Golden Big Band of 14 musicians. Dinner is designed by Fairmont Monte Carlo's Philippe Joannes and prepared by the hotel's Private Dining service. There are several price options based on the location of your table and food. Tickets start from 95 euros, half price for children aged 6-12, free for under 6s. Organized by Monte Carlo International Circus Festival. 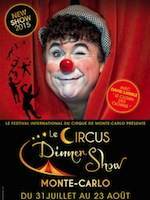 For more information and reservations phone +377 92 05 23 45, and visit the event website: Monte Carlo Circus Dinner Show. Tickets are also available from Fnac and usual outlets.